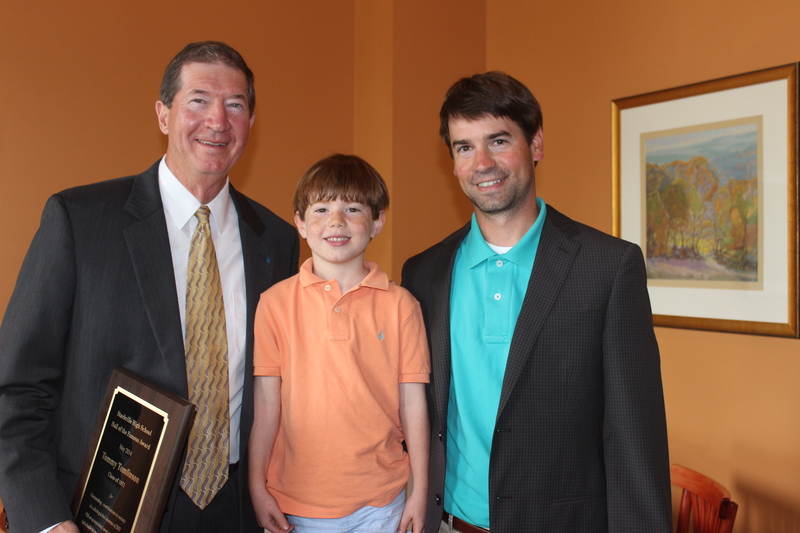 The Starkville Foundation for Public Education inducted SHS alumnus Tommy Tomlinson into the SHS Hall of Famous on Tuesday, May 27, 2014. Tomlinson, a 1971 graduate of Starkville High School, has distinguished himself as a respected leader in the banking industry in Mississippi. Tomlinson earned a bachelor’s degree in banking and finance from Mississippi State University in 1975 and began his banking career that same year in Meridian before returning to Starkville in 1983. Tomlinson has furthered his study of advanced financial education and major banking functions at the Graduate School of Banking at Louisiana State University, commercial lending schools at Oklahoma University and Vanderbilt University, and the Mississippi School of Banking. Prior to becoming president of Renasant Bank in 2011, Tomlinson was the regional president at Cadence Bank for nine years. Tomlinson is also considered a civic leader in the Starkville community. He’s served as chair of the CREATE Foundation and the Greater Starkville Development Partnership. He was awarded the T.E. Veitch Community Service Award, which is the Partnership’s most prestigious recognition for outstanding community service and civic contributions. Most recently, Tomlinson has supported Starkville public schools facilitating school tours for top executives of new industry locating to the Golden Triangle and offering the services of Renasant’s Japanese liaison to assist the District’s efforts to recruit new families to the Starkville and the Starkville School District. As president of Renasant Bank, Tommy has also generously supported SHS athletics as a major sponsor, committing $30,000 toward turf installation and construction of a new track at Yellow Jacket Field. Tomlinson and his wife Melita have three daughters and five grandchildren. Their oldest grandson, Henry, is a second grader at Sudduth Elementary School, and their son-in-law Rob Fyke is a biology teacher and tennis coach at Starkville High School. The Hall of Famous was established in 1992 to recognize outstanding alumni of Starkville High School and Henderson High School. Tomlinson, a 1971 graduate of Starkville High School, stands with his grandson Henry, who is a second grader at Sudduth Elementary School, and his son-in-law Rob Fyke, biology teacher and tennis coach at SHS.